The next practical question is: can we do something about it? The answer is yes, we can. It starts with awareness and knowledge. That we should not expect and assume that we know how. What do you think would be a failure rate for first timers jumping with a parachute without previous experience or instructions? Somehow, there are very few of us who would even think of jumping from 10km high without a parachute or with a parachute that we do not know how to use. I believe it is mainly due to that fact that the fatality rate for skydiving is even less than the one for car driving — below 1%. It is because we are aware that before trying to do that we should first learn how. However, we consider it completely normal to enter business partnerships — without learning about the pitfalls and mitigating the risks. Step nr. 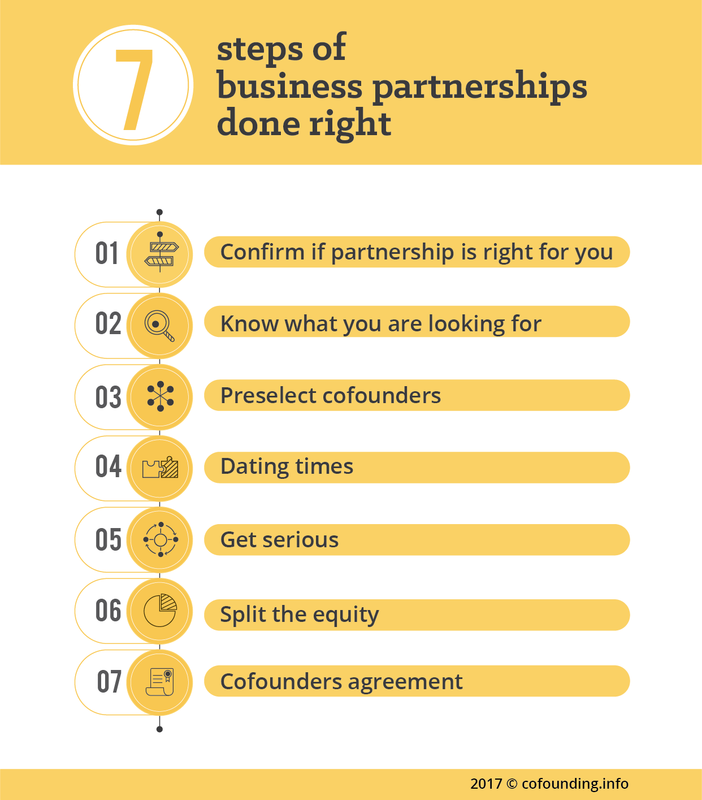 1: confirm that partnership is right for you. There is no one size fits all. Before going down the partnership route — check if partnership is the right choice for yourself and your project. Step nr. 3: preselect potential cofounders: once you know what you are looking for — spread the nets. Usual categories are friends, family, ex-colleagues — and while cofounders found in these pools can work — they do have some inherent increased risks. Plus — there might be other — more suitable candidates out there. Act as if you were recruiting your first employee — look wider & keep looking until you find the right one. Step nr. 4: dating times: do the due diligence! Get to know your potential cofounders — what are their working styles? Personalities? How do you work together? Try before you buy! Very important in this stage is to define the framework — what happens if the person joins your team? What happens if they do not? Do they have any right for compensation? Does that impact the ownership of the intellectual property potentially developed in this time? Make sure you have the conditions clear and understood by all parties and preferably documented in writing. Step nr. 6: split the equity: potentially one of the most sensitive and crucial parts of establishing a business partnerships. Default equal splits or ‘naked’ equity splits without vesting — are by definition a wrong choice. For cofounding team to be stable — fairness of the equity split is nr. 1 factor. The discussion about equity should also, next to equity allocation framework, include equity recovery framework — aka what happens with the equity if a cofounder leaves or stops being an active cofounder! Step nr. 7: cofounding agreement: only now talk legal. Once you defined the framework which fits your team — it is time to implement it in your cofounding agreement. Do go through the effort to find a lawyer who will help you to draft a cofounding agreement which is clean and simple. If you do not understand any part of it, it is not good enough! Crucial element is to keep it as a living document — make it a Christmas party tradition to look through your cofounding agreement and see if any part is dated and should be updated to reflect the actual reality of your cofounding team. Want to learn more? 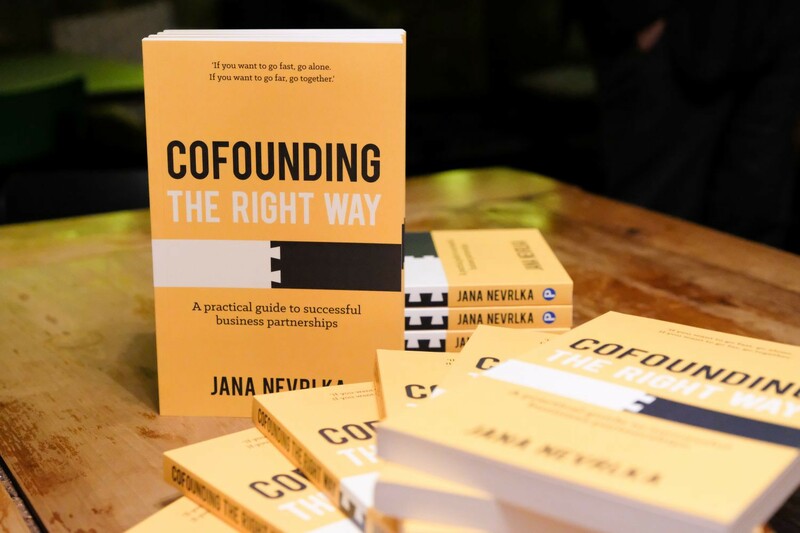 Get Cofounding The Right Way — a practical guide to successful business partnerships covering all the steps in detail. Originally published at zurich.impacthub.ch on February 12, 2018. Learn new skills from the experts of Impact Hub Zürich.